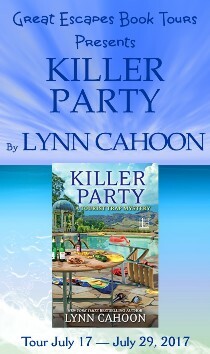 KILLER PARTY… is a delightful summer read! 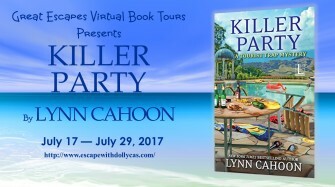 KILLER PARTY, is another mind blowing whodunit that had me alternating between smiling, and having my jaw dropped throughout the entire book. The author does a great job of hiding clues (and there are some looking back) and throwing many red herrings in your path. I’m always up for a visit to South Cove! I enjoy the recurring secondary characters and the way that Ms. Cahoon has built a townful of people I recognize and (mostly) like—including a few new residents introduced in this book. I really enjoyed trying to discover the killer in this book, it was a funny and quick read! This was a fun summer read! I love our main characters, Jill & Greg. 🙂 They’re likeable and well-rounded. I love this series so much I have been following it since the first book and Ms. Cahoon is like a fine wine and gets better in every book. The characters in Killer Party are layered as well as relatable, and the mystery is well-plotted and nicely paced. If you’re a cozy mystery fan and you haven’t yet discovered the Tourist Trap Mystery series by Lynn Cahoon, you’re really missing out! I have followed these guys from the beginning and love them as a couple and am so glad that Lynn Cahoun lets the relationship develop. I have always wanted to run a bookstore so having a successful owner solve the mysteries is one of “my” tropes.